Developer Walton Homes has hailed its decision to return to the Stafford area as a huge success, as its first site in the region approaches full capacity. The family-run business recommenced works in Stafford last year after a 10-year hiatus from the region, and within 12 months of launching its Redfern Rise site in Haughton, just one plot remains. Walton Homes now has high hopes for its other Stafford-based sites. 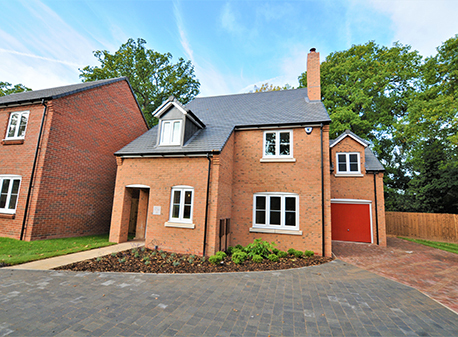 Amy Summerton, director, said: “We marked our return to Stafford with this eleven-property development off Rectory Lane, sure that its idyllic setting would appeal to buyers seeking smaller family homes in a village location. “We were delighted with the high levels of enquiries we received from the moment we commenced work, and now, having launched less than 12 months ago, we find ourselves down to our final plot. We’ve taken the decision to pay the full stamp duty on the ready-to-move in plot, along with £1,000 toward legal fees as we seek to close the sale. “We’re now concentrating our efforts on creating other developments within the region, with work on Creswell Croft, a 14-property site close to Doxey Marshes, being underway. The final plot at Redfern Rise, the four-bedroom plot 10, is available for £399,995, with more than £10,000 of incentives. For further information, contact 01543 412288.